This fall, the University of Redlands is making its official Snapchat debut. We are happy to expand into an exciting sphere of social media on Snapchat, and we invite you to join us on our newest platform for even more insights into the University of Redlands experience! Find us at @urbulldogs or add us using our Snapcode above. For those of you unfamiliar with Snapchat, it is a fun, photo-centric social media platform founded in 2011 that now has more than 300 million monthly users. About 75 percent of teens use Snapchat (about as much as Instagram and significantly more than Facebook and Twitter), making the platform a natural fit for engaging students and prospective students. 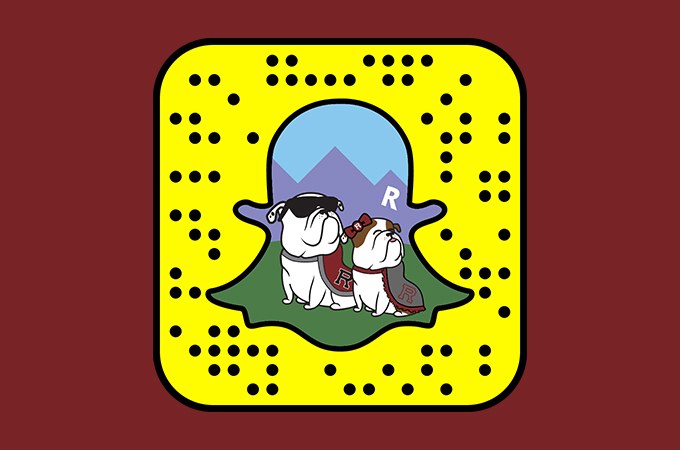 As such, student ambassadors will power our new Snapchat account with the help of the University Communications and Admissions teams, and we are excited to give users a glimpse into the life of University of Redlands Bulldogs! Here are the members of our student Snapchat team. Spencer Hill ’18, a business administration major and history minor, works in the Office of Admissions as a senior interviewer and is involved in student organizations including CHAMPS (high school mentoring), Hillel, and Maroon and Grey. As a senior with activities across campus, he will bring the breadth of his Redlands experience to the Snapchat platform. Marguerite (“Greta”) Jursch '21, a media and visual culture studies major, is on U of R’s cross country and track teams and works with University Communications as a social media videographer. "Redlands offers a lot to its students and community, so any new platform showcasing that is exciting,” she says. “Event coverage? Geotags being put to good use? Videos of Addie with the dog filter on? The possibilities are truly endless!" Lillian Otter '20, a political science major, says, "As an avid Snapchat user myself, I am looking forward to getting to show off our beautiful campus to prospective students and show what a day in the life is like here!" As for myself, Nathan Jones '20, I am a global business and German major. As someone who uses Snapchat to connect with friends and family throughout the globe, it would be wrong for me to not love that the University of Redlands is now on Snapchat! Also, don’t miss the University on other social media channels, including Facebook, Instagram, Twitter, LinkedIn, Pinterest, and YouTube. Our new social media directory highlights some of the most prominent University of Redlands social media accounts across our schools and campuses. Happy tweeting, posting, and, now for the first time, snapping!